These first days of January are a period that is a bit more quiet, with few smaller groups from Korea, the United States, Italy and Germany. 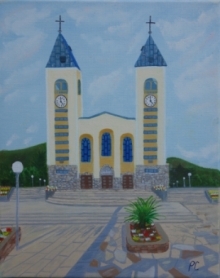 It was not so long ago that a young girl from Bavaria, Maria, arrived to Medjugorje. This is her fifth visit and this is what she told us: „When one arrives here, feels as this is indeed one Church, regardless of where did someone come from, that this is one community, one Body of Christ, gathered in the atmosphere of peace that comes only from Heaven. I feel that these messages we hear are surely very important to us youth and I also regularly read the messages that the Queen of Peace gives us. Those messages can sometimes seem difficult, but when it comes to me, I feel my progress is happening as I was brought up in the religious family and raised in the faith ever since my birth. Nevertheless, monthly confession, reading of the Holy Bible always requires certain victory over ourselves, a kind of renunciation, but once we get over that, it becomes the beauty“.